We’ve known about dark matter since the 1970s, when observations of rotation in spiral galaxies indicated that there was more mass in these galaxies than we can see. Now, we know this mysterious source of mass, called dark matter, dominates the matter budget in our Universe. Simulations tell us of a web-like Universe but it’s hard to explore this topic observationally because we can’t see dark matter. But the Canada-France-Hawaii Telescope (CFHT) Lensing Survey has made the first large scale map of dark matter. To trace dark matter, the CFHT team uses gravitational lensing. In lensing, light from a distant object (a galaxy or quasar) is bent by the mass of an intervening object, either a galaxy or galaxy cluster. In previous astrobites, we’ve talked about strong gravitational lensing, where multiple images of the background galaxy are formed. Here, we are talking about weak lensing: multiple images are not created, but the galaxy is magnified and distorted – ever so slightly – into arcs. By modeling the distortions of all these galaxies, astronomers can determine the mass of the foreground galaxy or cluster. The key thing about lensing is that it traces the total amount of mass, not just the mass contribution baryonic matter. That makes gravitational lensing an important tool for tracing mass because only 4% of matter in the Universe is the well-known baryonic (luminous) matter that emits light we can see with our telescopes. In practice, tracing the mass distribution in the Universe comes down to measuring the elongation of many galaxies: weak lensing will cause the galaxies near a foreground mass to be preferentially elongated in some direction. One of the complications that arises when trying to do this difficult measurement is that the galaxies aren’t that much bigger than the CCD pixels and are smaller than the point spread function (PSF). The PSF, which describes the effect an instrument has on a point source, varies significantly across the image due to effects such as the telescope and camera optics and can also vary between images due to, e.g. field tracking and rotation. The team needs to disentangle the elongation induced by weak lensing from these other effects. Astronomers from CFHTLenS measured the elongation of 10 million galaxies in 5 different filters over 5 years of observations at the Canada-France-Hawaii Telescope. Using these signatures of weak lensing, the team can reconstruct the mass profile of the foreground. The result is a dark matter map (see below) that shows us concentrated lumps, thin filaments and voids. When comparing their map to imaging data, they can see that the lumps of dark matter correspond to massive galaxy clusters and that voids in the dark matter map also match voids in visible matter. This cosmic web has been seen in large cosmology simulations but now can be confirmed and explored observationally. 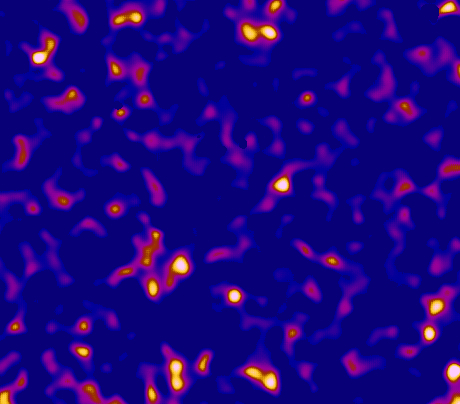 This false-color image shows the dark matter map constructed by the CFHT Lensing Survey. Dark matter concentrations are bright points and correspond to massive galaxy clusters while the dark blue regions are voids.